To create the new XR OS Irons, Callaway club designers took the company’s industry-leading Face Cup technology and made it even faster, implemented a wider sole design, and placed the centre of gravity in a location that helps optimise launch conditions. The CG has been positioned lower and further back, making these irons easier to hit and to achieve launch conditions that lead to more distance. The XR OS Irons’ multi-piece construction includes a new heat treatment of the face cup for even more ball speed, and a soft heat treatment on the body for better feel. 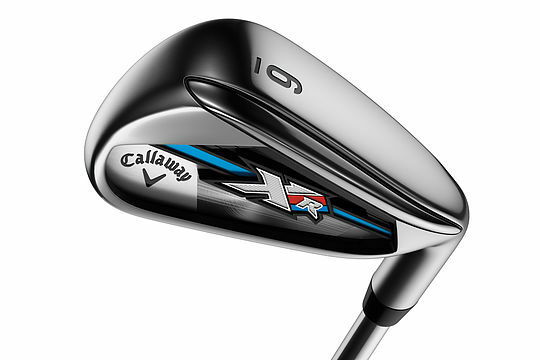 The wide sole design provides more forgiveness, and progressive lengths and lofts through the set are designed to give you more distance from each club. Specifically designed hybrids have been integrated into the set to offer greater forgiveness and distance in your long game. In addition, the women’s XR OS Irons feature a wider sole, graphite shafts and light swing weights to help deliver more distance.